« Here’s to the Old People! My family always played games…card games like Gin Rummy, Battle, I Doubt It, Go Fish, and a bunch of others along with any kind of solitaire we could find. We played board games when I was growing up…Clue, Monopoly, checkers, Chinese checkers, and all the other classics. Daddy played with us, but he and his friends played Gin Rummy. And they bet real dollars. My mother played Mah Jongg with four of her friends for 25 years. They met weekly for lunch, Mah Jongg, and whatever they talked about. We all knew the names of the tiles and had a little knowledge of how to play. When I was a young mother, a bunch of us played. My mother got us started and we played regularly for several years until our kids’ activities and our own got too complicated. I hadn’t thought about it at all until one of my friends said she wanted to play again…it would be good for our brains. So four of us are playing…three from the old group and a novice. It’s a funny game because so few people know what you’re even talking about. Although it’s actually like rummy, it has its own language, rules and great equipment. We get a kick out of it. We like the sound of the tiles clicking when you “shuffle” them by moving them around the table with both hands. We like the pretty tiles and the names of the suits…Bams, Cracks, Dots, Flowers, Winds, Dragons and Jokers. One of our group said, “I just like to say I’m going to play Mah Jongg.” How exotic. There is a lot of history in games, whether card or board. 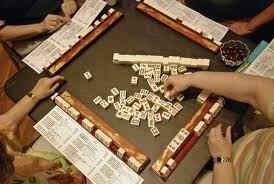 Mah Jongg goes back to the ancient Chinese and came to America in the 1920s. It’s identified with Jewish women, who created some of the current rules we play by. Wherever it comes from, it’s fun and it really does make you concentrate and think hard. We haven’t gotten to the point where we play for actually money, as my sister-in-law does in Texas, where her group plays for a nickel a point. Right now we’re just having fun and feeling very proud when we say “Mah Jongg” for a winning hand. Not much better than spending time with friends, having fun, and feeling a strange link with people who played the game oh so long ago. Makes you smile! You might enjoy: https://mail.google.com/mail/u/0/?shva=1#inbox/1419524be4e19d54 It’s about the Olympic Peninsula. Loved your Oregon post. Thanks, Georgia! I’d have posted more, but I was having such a wonderful time just living it!